After successfully collecting a few flakes of gold during our gold-panning excursion at Gold Creek in Juneau, Alaska, we were hungry and cold. 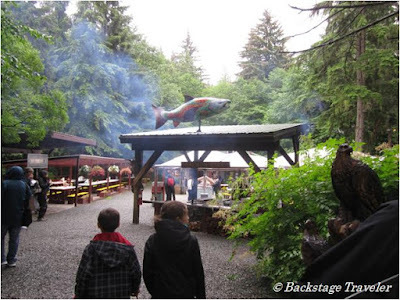 Luckily, the second part of our ship-booked shore excursion included a trip to the Gold Creek Salmon Bake for supper. Our tour guide, Dig-In Dave, gathered us onto our mini-bus for the short drive in the drizzling rain. Upon our arrival, clouds of fragrant smoke, a giant wooden salmon and a folk-music singer welcomed us to the salmon bake site. Welcome to Gold Creek Salmon Bake! The salmon bake is located about a 10 minute drive from the cruise ship docks. There are buses making regular runs back to the ships, so guests can stay as long or as short as they like. At a stand just inside the entrance to the salmon bake was a friendly soup lady, handing out small cups of hot, creamy clam chowder to the arriving guests. Although the portions were quite small, the soup was tasty and satisfying, and we went back for seconds. For many of us, this was the best part of the meal. The fragrant smoke came from the burning alder wood, used to smoke the star of the show, fresh Alaskan salmon. The cook brushed each piece with his "special sauce" before grilling the fish over the open fire. There was plenty of salmon to go around, and an all-you-can-eat buffet stocked with sweet corn bread, wild rice pilaf, Chilkoot baked beans, Cheechako chicken, tossed green salad and Alfredo penne pasta. Free drinks included ice tea, fruit punch, hot tea and coffee. 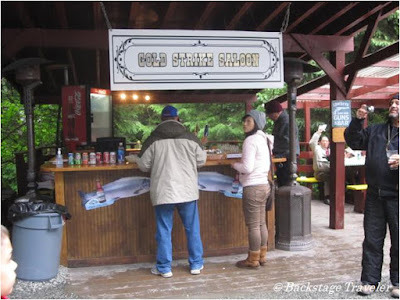 A bar located next to the soup stand and across from the grilling station sold beer and wine. 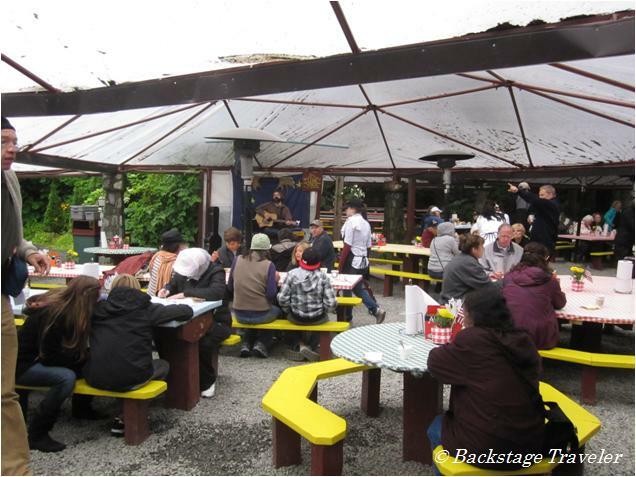 The eating areas were well protected from the light rain by white tarpaulin tenting, and outdoor space heaters kept diners warm. In the background, a Cat Stevens-esque singer, accompanied by his guitar set a folksy mood for this family-style outdoor barbeque meal. A small gift shop on the premises was a good spot to pick up some souvenirs, including a gold panning kit complete with pan, gold-laced Alaskan sand and instructions. I found the food quality to be average, at best. Everything was edible, but not particularly memorable. 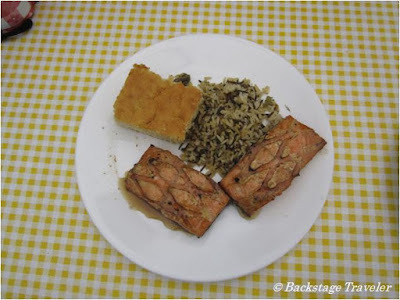 The salmon had a sweet, smoky taste, which was judged to be good by some of us, but tasteless by others. The same can be said of the corn bread, which was pronounced "too dry" by some, and "delicious" by others. Overall, this stop was a pleasant ending to our day in Juneau, and provided a friendly spot to fuel up and relax after all that gold-panning out at Gold Creek. 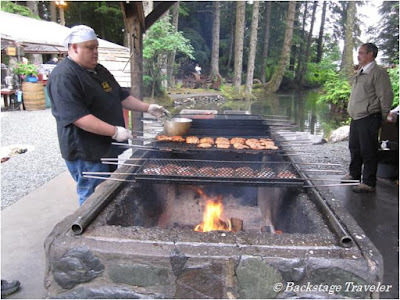 This article recounts our experience on the second portion of the "Gold Panning Adventure and Alaska Salmon Bake" shore excursion in Juneau, Alaska on July 18th, 2011. It was purchased through Holland America Line on board the Zuiderdam, and cost $79 per adult, $54 per child. This excursion lasts approximately 3 hours in total, and we spent about half of that on the gold panning expedition to Gold Creek, and the other half here at the Salmon Bake. I agree! This was probably the best part of our cruise. Weather was lousy, got seasick and brought home a pesky bug that's lasted for nearly a week. The Salmon Bake reminded us of the old-time community picnics with great food we didn't have to cook ourselves. It was definitely authentic and as I kept my eye out for bears,a big blackbird actually grabbed my fish from my plate as I left to get a drink. I gobbled down the salmon, chicken, salads and beans,and saved enough room for the blueberry cake dessert which was to die for!